You are stealthy, quick, good with traps, and deadly with sneak attacks! You’re always one step ahead of danger. 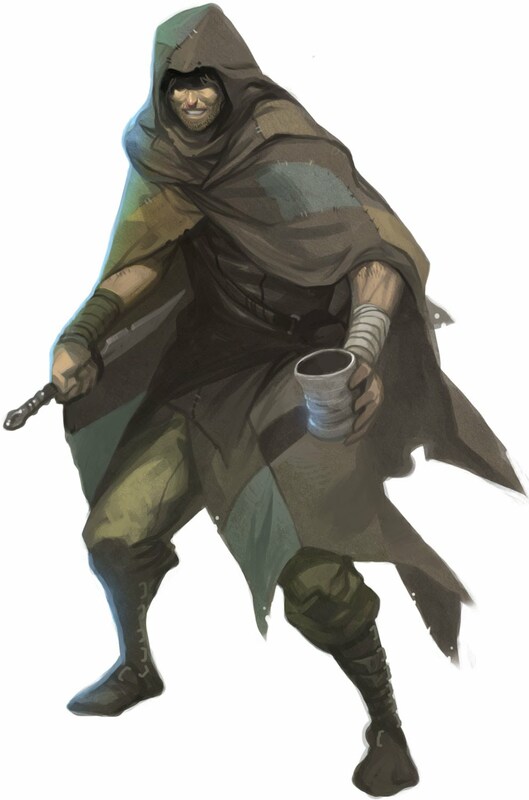 Rogues like quick, sneaky weapons and flexible armor. In Section E of your character sheet, check light armor and simple weapons. Then write rapier, shortbow, and short sword in Section E. You’ll learn more about armor and weapons later. - Your opponent hasn't acted yet in combat. - You are flanking the opponent with an ally. - The opponent is helpless. Sneak attack bonus damage is not multiplied on a critical hit. You can make a sneak attack with a melee weapon or a ranged weapon. If you use a ranged weapon, your opponent must be within 30 feet of you to count as a sneak attack. notice magical traps, but can’t disable them). Write the following under your class features (Section F). damage. If you make the Reflex save, you take zero damage instead! If a rogue talent has an asterisk (*) after its name, it adds to your sneak attack, and you can only use one of these talents per sneak attack (decide before the attack which one you’re using). When you damage an opponent with a sneak attack, it takes a –2 penalty on attack rolls against you for 1d4 rounds. You gain one combat feat (see fighter combat feats). You must meet all prerequisites for the feat. The maximum range at which you can make a sneak attack with a ranged weapon increases by 10 feet. Once per day, you can attempt any Knowledge check, even if you don’t have ranks in it or the DC is higher than 10. Your jumps always count as if they had a running start. When you deliberately jump down, treat the distance as 20 feet shorter. You can use the Disable Device skill to attempt to open a lock as a standard action instead of a standard and a move action. You gain the Weapon Finesse feat, which lets you use your DEX instead of your STR on attack rolls. Choose one wizard cantrip. You can cast this cantrip three times per day as if your wizard level were equal to your rogue level. When you fail a Climb check by 5 or more, you can immediately stop your fall if you make another Climb check at the DC + 10. If you take a –2 attack penalty on a sneak attack and don’t move on your turn, treat all 1s on the sneak attack damage dice as 2s. Whenever you use the Disable Device skill to disarm a trap, it takes you half the normal time (1d4 rounds instead of 2d4). If you have a ranged weapon ready in the surprise round, treat your initiative in the surprise round as if you had rolled a 20. You can stand up from a prone position as a free action instead of a move action. Whenever you come within 10 feet of a trap, you get a free Perception skill check to notice it. The GM makes this check in secret. You gain the Weapon Focus feat, which gives you a +1 bonus on attack rolls with one type of weapon. Your sneak attack increases by +1d6. TRAP SENSE: You get a +1 on Reflex saves against traps and a +1 bonus to your Armor Class against traps. Your trapfinding ability increases to +2. ROGUE TALENT: Pick another rogue Talent from the list above. UNCANNY DODGE: Your enemies no longer get an attack roll bonus when flanking you! Other rogues can’t sneak attack you when they flank you!